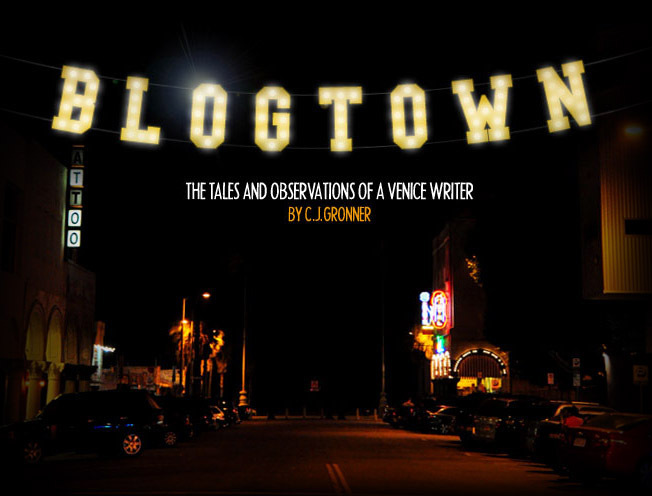 Blogtown: The May Venice Art Crawl - Shredtastic! The Spring (and Norwegian National Day! 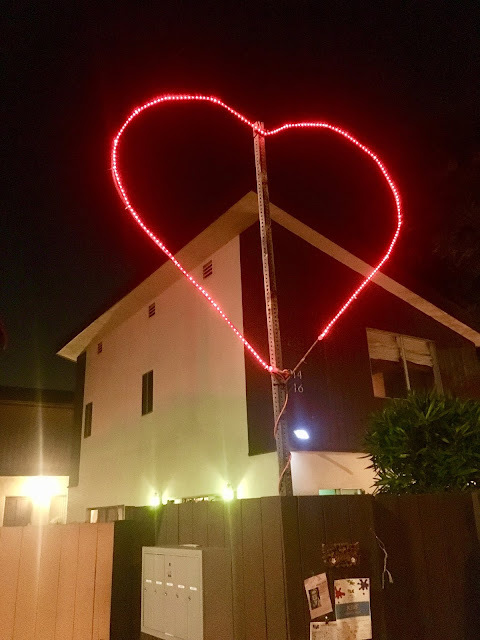 - I care) edition of the Venice Art Crawl was held last night, and was as excellent of an evening as it always is. I'm working on a show that gave me a late start to crawling, but I put on my race-walking shoes and got to see as much art as I possibly could. 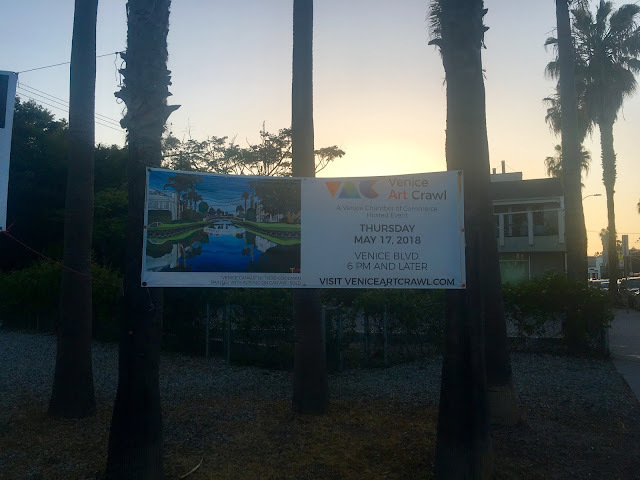 This time around the VAC was focused on our "Cultural Corridor", as I like to call it, of Venice Boulevard. I started at Beyond Baroque, but it looked like an AA meeting was happening (as it has been on VAC nights before), so I kept on trucking to the Venice Library to get a map. It was there that I found out it WAS a stop on the Crawl, and not an AA meeting at all. Oops. Well, good turnout, Beyond Baroque, I'm sorry I missed it! The library art part was over by the time I got there, but I understand little kids were painting outside. Dang it, that would have been adorable. Friends were texting that they were over at Hama Sushi, enjoying sake and the fantastic Venice photographs from Todd Van Hoffman. It was jam packed inside Hama (sorry, waiters! ), so the shindig soon expanded to outside, where The Jewpanese Brothers (Masao Miyashiro and Jeremy Parker) were ripping it up outside under the portable Venice sign that accompanies our various event parades. 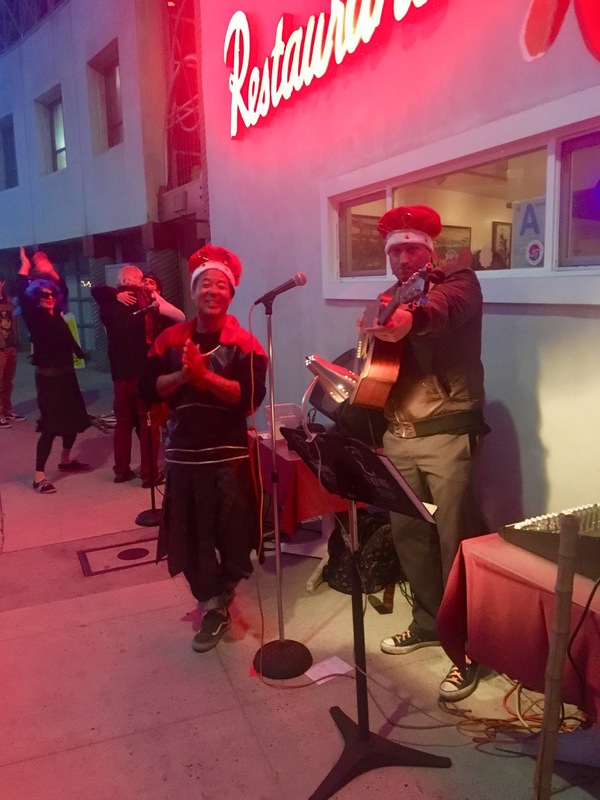 People were singing and dancing in the street in Windward Circle - exactly as they should be. My friends wanted me to sit and have some sushi and sake, but I protested, as there was still so much ground to cover and art to see. A man sitting there said, "You're putting a lot of pressure on yourself. 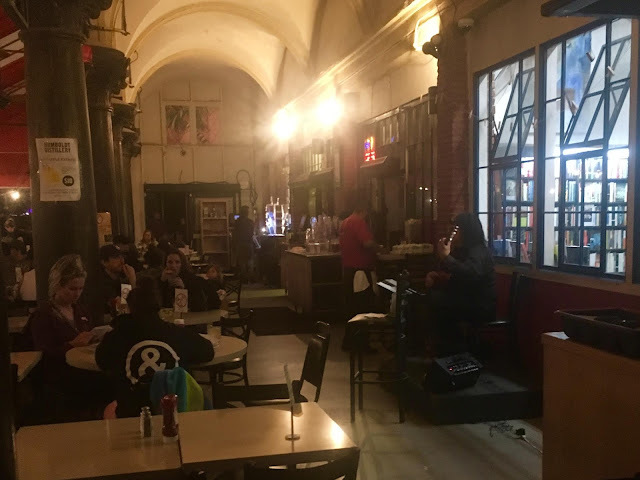 Part of the Art Crawl is to see your friends and neighbors and enjoy yourself. It's ok if you don't see everything." That was nice of him ... and I should have listened, because I ended the night starving with no kitchens still open - but I DID get to see a whole lot of art. 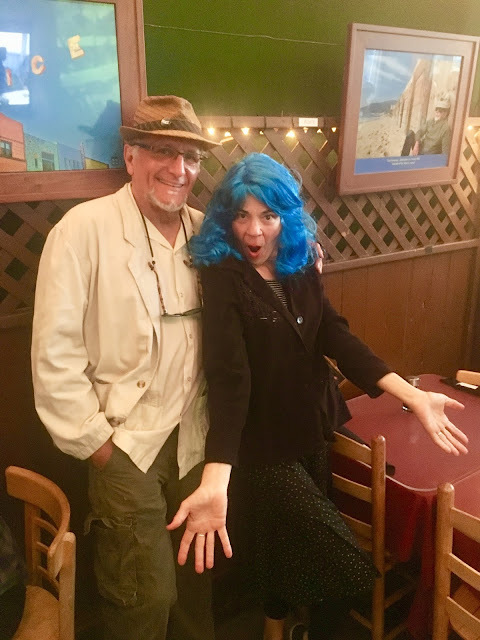 The next stop was Surfside, where we were going to see the excellent photos from Ray Rae Goldman, but we got there and were told that he had cancelled due to an injury (hope you're ok, Ray!). 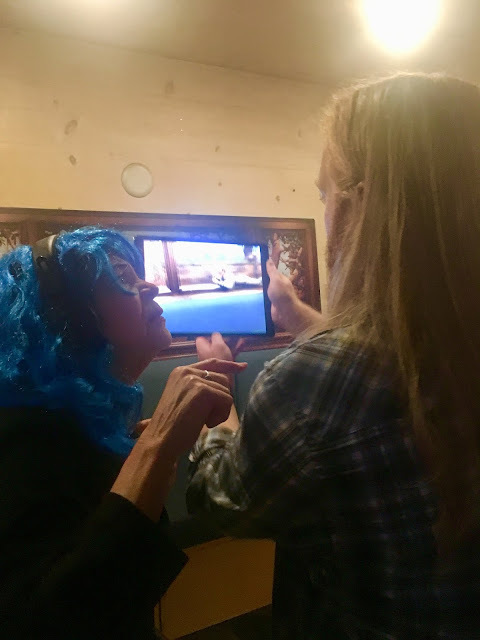 There WAS, however, more super cool AR stuff from Cody Nowak and the app ReBlink, who had impressed us at the last Crawl. This time out, he truly blew minds. Classic style paintings hung on the wall, but when viewed through the Ipad (or the app on your phone), they came to life in striking and spectacular fashion. Like, WOW. Suzy Williams had never seen any AR, and I think her face below sums it up. There were also paintings by Deborah Medina at Surfside that greeted you as you walked in, and that's what I love about the Crawl. So many Venice businesses open up to include art and art lovers, recognizing that ART is a major reason why Venice ever became Venice. 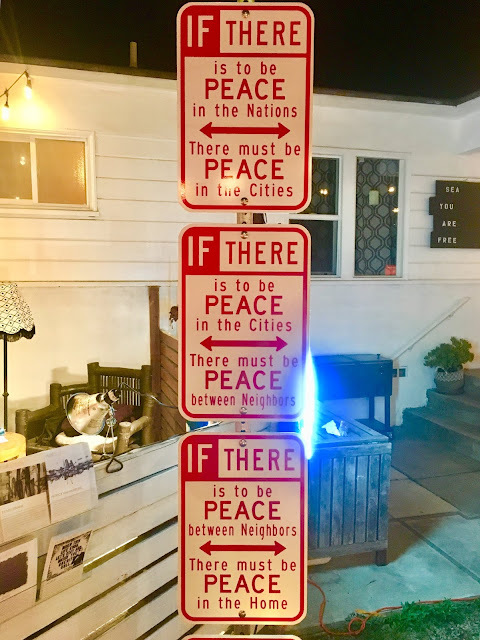 They know that over at Small World Books (best book store on the West Side! ), where they had the work of Alex Crist AND free guacamole! Win win. Next door at The Sidewalk Café they were showing the watercolors of Elizabeth Covington and the photos of Dan Kacvinski, with live Japanese classical guitar music on the patio from Ashun that was simply lovely. 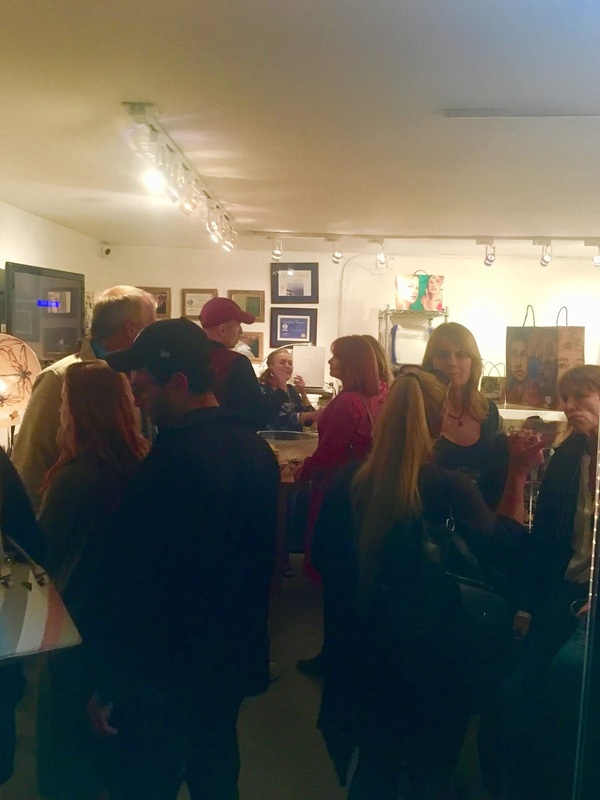 With no time to waste and the clock ticking, we sped down Speedway to North Venice Boulevard, where a collective of 10 women were showing their art and jewelry in an apartment so packed with friends and neighbors we could barely squeeze inside, even though there was wine. Leila Jean Levi, Michele Pelletier, Aly Farrow Wilkins, Mildred Rivera, Karen Gladstone, Joanne Silver, Susan Ryza, and Sage Ryza all showed their cool stuff, making friends and sales along the way. We could have stayed and chatted the rest of the night, but, again, time was of the essence. 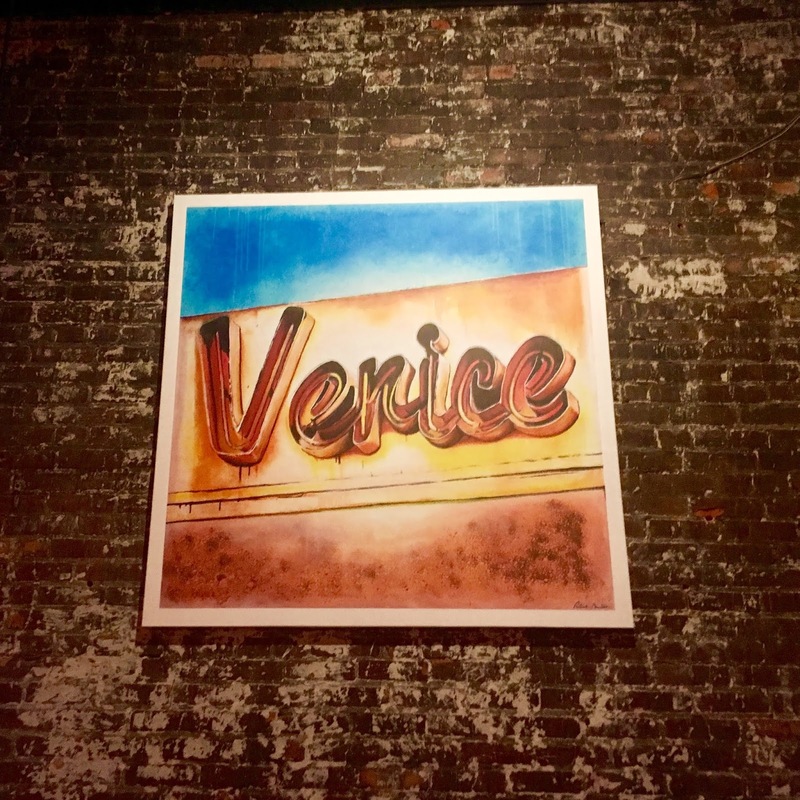 ... And Todd Goodman was showing his Venice inspired art in the back room. I pretty much wanted every piece, and was happy to see that Goodman was selling his colorful, beachy prints left and right (and I was happy they were prints, because otherwise he'd priced them far too low - get one!). 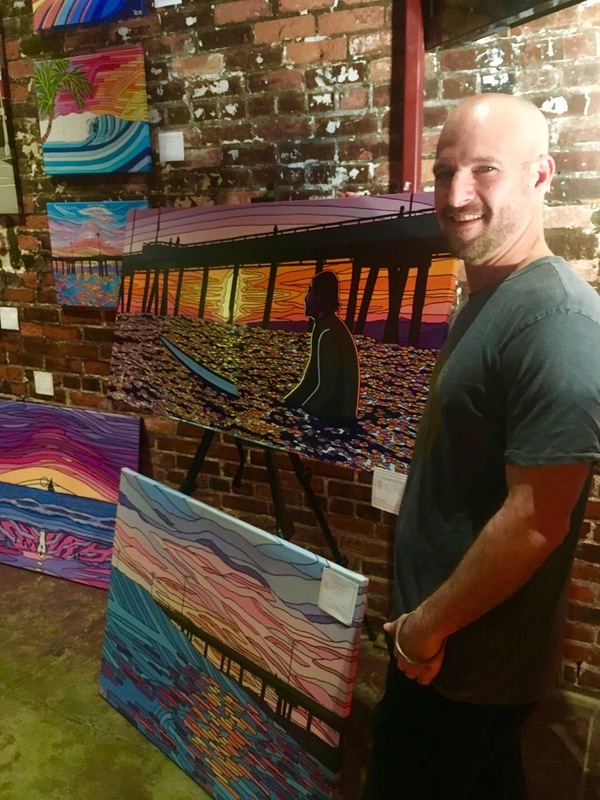 From the pier to the sunsets, Venice is beautifully represented in his work (which was also the poster for this Crawl). The most fun part of the Crawl is always running into the locals that you know and love. This happened non-stop last night, which was so heart-filling, but also slowed down the racing a bit ... maybe a good thing? A whole crew of us formed and headed over to Sunny Bak's pad, where there was a "Broken Heart Repair Shop" set up. A nurse (Candy Frost) sat at a little table and listened intently to the lovelorn people lucky enough to snag a time slot, and offered prescriptions for their heart's recovery. Though deeply needed, I was not among those to get an appointment, and the guy that had just finished his own diagnosis had his lips sealed (though with a look of serenity on his face), so I can't really report as to what really went down. And my heart still needs fixing ... but I digress. Onward! An evening stroll back up Venice Boulevard led us to the Wallspace pop-up happening in the yard at Sea You Are Free space on the corner of Venice and Abbot Kinney. It's always a good time there on the corner, and last night was no different. 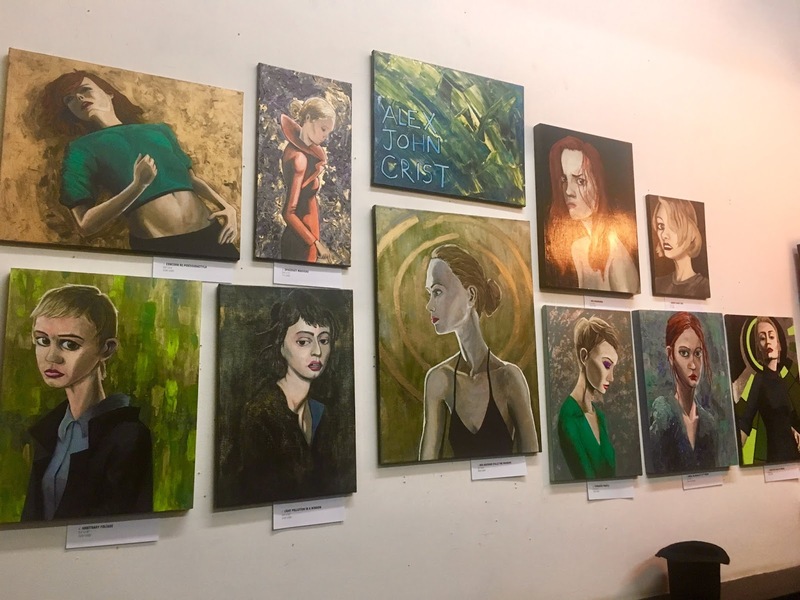 Wallspace represents several artists, and there were about 10 different ones showing there last night. I think my favorite of the bunch were the street signs repurposed with cooler words from Scott Froschauer ...with more uplifting messages than the typical "Stop" and "Yield" and "No Parking". Once we realized there was only ten minutes left in most of the VAC stops, we sat down on a bench in the yard and finally took a breather. My friend's son, Declan, was with us much of the Crawl, and after spending the whole evening looking at art and meeting up with O.G. Venice folks, he said, "I'm so happy we live in Venice." This kid was born and raised here, so that made it even more special. He doesn't take if for granted, and every day feels fortunate to be brought up in such an original place that cares about our art and our community. I feel exactly the same way every day, but it's nice to hear it from a kid. Now starving, we set out to find food only to find that almost every place on Abbot Kinney now closes their dang kitchens at 10:00 p.m. That is lame. 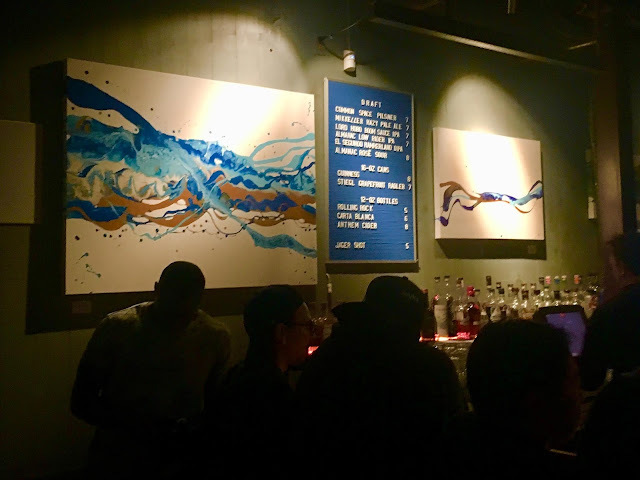 Drinks were no problem (and there was even art at The Brig and Wabi Sabi, by Nicole Hoffman and Debbie Zeitman, respectively), but that's never a good idea on a completely empty stomach. We did an entire lap around Venice - for real - and found that now back on Pacific, even Mao's was closed! Where is an Art Crawler supposed to eat AND see all the art?! A real conundrum ... with the answer ending up being In and Out. Sigh. No real matter ... it was another fantastic event that we are lucky to have going down in our town. And now the annual Art WALK is this Sunday, so it truly is almost an embarrassment of artistic riches down here. Come see, won't you?